A Trinidadian who was contracted by a company of the Twin Island Republic to transport a quantity of bottled coconut water from the Pomeroon River in Guyana was caught trying to steal containers with the coconut water from the Da Silva’s stelling in the Lower Pomeroon in the middle of the night. The incident occurred on Monday July 8. According to Farmers’ Representative in the Pomeroon Mrs. Vilma Da Silva, she has a contract to supply 50,000 liters of bottled coconut water to a Trinidad company each month but the first shipment she attempted to send encountered difficulties, caused mainly by the man who was contracted to transport the cargo of coconut water by cold storage on his boat. 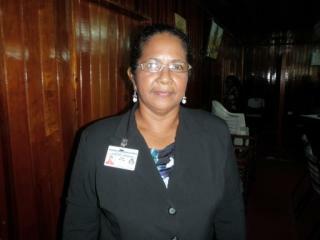 Mrs. Da Silva said the market for the coconut water will increase the earnings of coconut farmers in the Pomeroon. She told iNews that when the boat arrived in the Pomeroon to transport the first shipment, some farmers tried to use politics to destroy the lucrative market for water coconuts. Mrs. Da Silva said when the boat arrived, she checked if the cold storage was in operation and found that it was malfunctioning although the owner of the boat assured that it was working. According to her, she became worried and suspected that something was not right and called the company in Trinidad. She said the boat went to Charity and did other business with persons and loaded a number of equipment for Barama River in the North West District. She explained that while in bed on Monday night, she heard noises and awoke only to discover the boat that was contracted by the Trinidad Company to transport the bottled coconut water was near her stelling and the Trinidadian was trying to load the containers unto his boat without her knowledge at around midnight. According to her, she contacted the Charity Police Station, and that officers promptly responded to the scene. Da Silva said that the Police Officers instructed the man to drive the boat to Charity where it will be impounded. However, according to her, while the boat was on its way, it suddenly turned back and headed for the Pomeroon mouth. She said the Police Officers tried to get the Coast Guards at the mouth of the river but there was no response from them and the Trinidadian escaped with his boat from the Pomeroon River with some twelve Guyanese on board who were headed to Barama with their equipment. Mrs. Da Silva said the Trinidadian has violated the laws of Guyana and refused to obey the orders of the Police and called for the matter to be further investigated at the Caricom level.